Fall Bass Fishing Good Or Bad? Article categories → Bass (Species) → Fall Bass Fi…Good Or Bad? 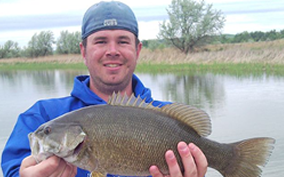 The answer to the question is fall bass fishing good or bad is that fall bass fishing is great. There are two times a year when bass fishing is at its best and that is early spring when bass are in the pre-spawn stage and fall. The spawn is past but soon cold fronts will begin to make there way through and temperatures will begin to drop creating conditions favorable for bass fishing. Cooler water temperatures usually means more oxygen in the water which leads to more activity which in turn means the bass will feed more. They will strike just about anything you throw at them but as with any body of water you will have to experiment some to find out what works best. As I mentioned before cooler water will make the bass more active so you should look for areas where shallow water is close to deeper areas The impact of the cooling effects of the longer nights trigger bass in many lakes to begin a shift or migration. This movement is toward the back of coves, up creeks, or to a shallower staging area. The shad also tend to make similar shifts at this time that probably plays a large role as an additional attraction for the bass to make their move. I make this point regarding shad because they are still the main forage bait for bass in most major reservoirs during the two earliest phases of fall. Because of this very fact, crank baits are particularly lethal for finding schools of bass in the early and mid-fall periods. Since the schools are working on shad, this should also tell you that the bait color most productive will be silver chrome, bone, or white. Look for structure both below water and protruding above water. Top water baits are also ideal lures to work in the fall periods. Not only can they be fished near banks and vegetation but the can be fished effectively over deep water structures. The buzzwords for fall bass fishing is shallow and structure. As the water temperature cools you will find more bass schooling in the shallow water and they are more likely to be near structure where they can ambush their prey. Doug Burns has been an avid angler for 35 years. For more bass fishing tips, tricks and information visit Bass Angling For catfish fishing tips, tricks and information visit Catfish Angling.